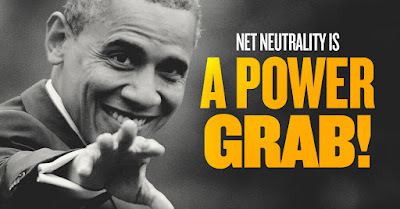 The left is hysterical over Trump's Federal Communications Commission (FCC) revoking Obama era Net Neutrality. The situation is so nasty that FCC Chairman Agit Pai has received death threats, here, and his family has been harassed by liberal goons and thugs, a very troubling event that has required beefed up security for Pai and his family. If we look at the heart of the Net Neutrality issue, it's kind of like Obamacare - force other people to pay for products or services that leftists and socialists demand or think you should have. In the case of Net Neutrality, the central component of the issue evolves around a government intervention to lay the foundation for an eventual takeover of the Internet by the government. Although just about everybody uses the Internet, some folks are notorious bandwidth hogs who stream a ton of video and music. Personally, I only use the Internet for email and social media and don't stream music or video so when it comes to my bandwidth usage, it's quite light. The telecom companies wanted to charge folks according to bandwidth usage and the left went berserk. They demanded that Internet usage be socialized and that everybody pay the same regardless of how much bandwidth they use which effectively translates to a financial subsidy to heavy bandwidth users by low bandwidth users. To further complicate the issue, the Net Neutrality advocates oppose the telecom companies having any power whatsoever on the issues involving their products and services, and demand that the Internet be classified as a government regulated public utility that anti liberty, anti 2nd Amendment folks would control. The heart of the Internet's ability to function is bandwidth. Without lots of bandwidth, there is no Internet. Bandwidth is expensive to produce and the telecom companies invest a ton of money into constantly upgrading bandwidth capacity because the motives of the telecom companies are keeping customers happy and earning profits. Of course, the left has the highest level of disdain for the word PROFIT and if they had their way the Internet would be nationalized as a non-profit government run entity. LOL, if you think that the Internet is expensive now, just imagine how much more expensive it would be if the government ran it. Government destroyed healthcare and to the point where hardly anybody can afford it. There are indeed other important issues like the 1st Amendment. If telecom companies are denied the right to earn a profit, they will have ZERO motivation to invest in bandwidth. What happens? There will be a bandwidth shortage. What happens next? The government will step in and decide who gets bandwidth and who doesn't. This effectively translates to government censorship of the entire Internet. This is the goal of the left and technology-information Nazis. The totalitarian dream of government control freaks and their bureaucrats is total control over the flow of all information. By denying the telecom companies profits as well as stifling entrepreneurial incentives, the left seeks to utterly destroy the free and open flow of information. FCC Chairman Pai believes, as does President Trump and sane folks who understand the issue, that a free and open Internet is in the best interest of liberty, the free flow of all information (not just government approved information) and technological advances. With the Internet the free flow of information has radically transformed the flow of information and for the better. Folks now have more information at their fingertips than at any other time in human history. This indeeds spells trouble for control freaks and government. I'm in no way implying that the telecom companies are saints or even moral. In fact, many of them support Net Neutrality as a means to solidify their own aspirations for monopoly. The Internet needs more openness and competition; otherwise it will incur the fate of mainstream media and its propaganda apparatus. It's freedom itself that keeps freedom alive. Any efforts to destroy Internet freedom would be disastrous and Net Neutrality was a blue print to destroy freedom. Folks who believe that government can guarantee freedom are indeed delusional and maybe even psychotic. 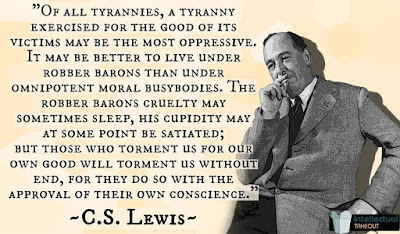 Government is the most anti-liberty institution on the planet and it only exists to tax, plunder and eradicate freedom. Don't like the telecom companies? 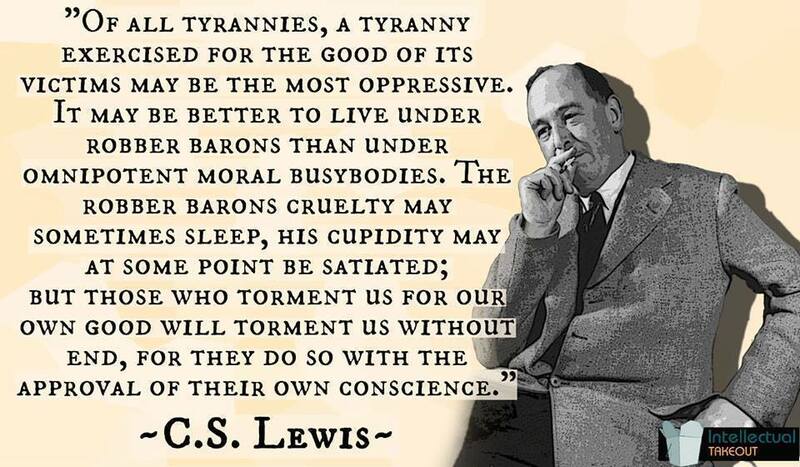 C. S. Lewis summed up the situation best and before there was even an Internet. While free markets tend to mitigate the raw and absolute powers of the robber barons through competition, the robber barons are still preferable to anything that the government ever does. Don't believe it? Just checkout the cost of government controlled healthcare vs. what free market healthcare used to cost. Healthcare was once affordable and relatively cheap until the government stuck its nose in it and ruined an entire industry. With the issue of information, technology and the free exchange of information without government censorship, the stakes are indeed quite high. The demise of Net Neutrality is a giant step for mankind and another reason why I'm glad that Trump defeated Clinton. Let the telecom companies invest in products, services and technology and let the markets work it out. Why? Because it WORKS and makes consumers happy. Good article, I am a bit less confused by this issue for reading it. Those cell phone companies sure don't have any qualms about charging by amount of band width used!